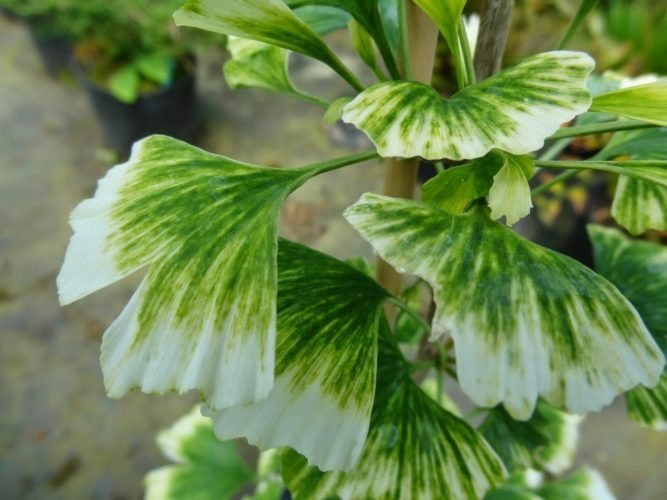 Ginkgo biloba 'Snow Cloud' is a new introduction of Maidenhair tree with stunning variegated foliage, which does not appear to be subject to reversion. Its growth consistently emerges colored a soft cream which develops yellow tones and then matures to a more defined green with varying white blotches and streaks. However, some leaves may never green out, but remain cream colored. Although Ginkgo are tough by nature, siting of this plant is critical. Too much intense sun can burn variegated parts, and too deep of shade can significantly green out the specimen, reducing its effect of significantly brightening a garden spot. In the autumn, the plant will glow as the leaves turn bright yellow before dropping. Since it is such a new introduction, its ultimate size is not certain. However, its lack of chlorophyll due to its degree of variegation is expected to restrain its growth. It probably will assume a more shrub-like form of less than 10 feet (3 m) tall in 10 years. At this time, this cultivar is of unknown origin. This plant was one of three selected in 2016 for the ACS Collectors Conifer of the Year program. Ginkgo biloba 'Snow Cloud' — a closeup of foliage detail.